This article is a look at some things to consider when buying a GPS. The focus is GPS for outdoor recreational (or commercial) activities. 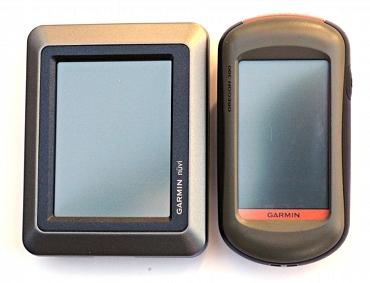 All the examples are Garmin units, as this company's products are by far the most popular in New Zealand. In this article we mention specific GPS units as examples. Use these as points of reference. Keep in mind that new models are appearing constantly and units not mentioned here may suit your needs. When choosing technology, the path to success is starting with a clear idea of what you want to do. There is probably no perfect GPS for you. There is going to be a combination of features that you want that no GPS satisfies. Tramping & Hunting. You want a small, robust, light, waterproof unit with good battery life. Units that can display topomaps and street maps are very popular, but the non-mapping models are cheaper. There are also specialised hunting models that have GPS collars for your dogs so you can track their location. Geocaching. Models like the Garmin Colorado or Oregon models, with built-in paper-less geocaching features will probably appeal. Though any outdoor GPS can be used. Street driving & 4WD. Vehicle navigation models feature large screens and touch-screen controls. These units are usually not waterproof or drop-proof. On foot, they are suitable for urban navigation. Unless they are ruggedised, they are not recommended for tramping. If you mostly want it for driving, 4WD, a waterproof unit like the Garmin Nuvi 500 might be a good compromise. Take a close look at the features though. You can load waypoints into most vehicle units, but many of them don't record tracks for later download. Also most of the vehcile units don't allow you to upload a track from you rPC into the units. Biking. There are specialised biking units with cadence and heart-rate sensors and training features. For mountain biking any outdoor unit will probably do fine. Many units have a handle-bar mount as an accessory - keep in mind these expose the GPS to a fair amount of vibration. Use with a computer for real-time tracking. The GPS choice depends on the software being used on the computer. Most software will support NMEA protocol. NMEA protocol is used by most serial port, USB "mouse" style and Bluetooth GPS units. Look for units with high-sensitivity receivers like the SiRF-III chipset. Bluetooth GPS's are conveniently wireless, but USB and serial GPS units are less fiddly to set up and use. Some software, like our own MapToaster Topo/NZ also supports the proprietary Garmin protocol used by their outdoor units. You'll probably have a mix of these activities, but the primary use will push your choice to one particular category of device. Sensitivity. If you plan on using the GPS under tree canopy or in a car in areas with tall buildings, you will want a GPS with a high-sensitivity GPS chipset. SiRF-III is a common chipset, but there are others. Pretty much all the units available now will have high-sensitivity GPS chipsets and at least 12-channel receiver, but you should check the specfications. The cheapest GPS units often don't have high-sensitivity receivers - we don't recommend these unless you're on a tight budget. Mapping capability. Having topomaps and street maps showing on the GPS makes navigation much easier. Storage for maps. Does the GPS have a slot for an external memory card? If you want to load topomaps on the unit, you will need the ability to load maps on a microSD or SD card. Some GPS units have only limited built-in memory. Topomaps require a lot of storage, so limited memory and no microSD means that you will ony be able to load maps from part of New Zealand at a time, e.g. load the maps for a particular tramp. Voice prompts. Some vehicle navigation units feature spoken prompts to guide you through your route. Most of the Garmin outdoor units can provide street navigation, but only provide on-screen directions and beep when you approach a turn. Bluetooth hands-free. Many of the vehicle navigation GPS units have Bluetooth. This allows you to connect the GPS to your cellphone and use it as the microphone and speaker for hand-free calls. Many vehicle navigation maps have built-in business directories and you can use the bluetooth connection to dial the call to the business, from your GPS. Car/bike mounts. Does the model have the mounting accessories that you need? External antenna connector. If you are using the unit in a boat or vehicle you may want to be able to connect an external antenna. External power connection. In a vehicle you'll want to be able to run the GPS with the screen backlight on continuously. An external power connector is essential for this as internal batteries wont last long. Waterproof. If you're going tramping, you need a waterproof GPS. We sometimes get asked about using a vehicle navigation GPS or smartphone for outdoor navigation. While putting it in an Otterbox will keep it dry, it will be hard to use. If you rely on a plastic bag or pack to keep one of these devices dry, sooner or later it will end in tears. Screen. Big enough/easy to read, backlight brightness. Check in bright sun. Bigger screens are desirable for vehicle navigation. Internal compass and altitude sensor. A basic GPS unit can only show direction when when you are moving. Some GPS units also have an electronic compass and can display direction when stationary. Also a barometric sensor provides more accurate altitude tracking. They cost a bit more, but we think it's worth it. Battery life. Battery life can vary a great deal depending on the model and how you use it. In terms of weight, you need to think about the battery life and the number of spare batteries you'll need for a typical trip. Do I need to buy maps as well? Street navigation units are usually sold with New Zealad maps included. Maps are typically an extra for outdoor units. When buying topomaps, you should buy them on CDROM, rather than on microSD card, as you will need a CDROM versions to load maps from multiple sources at the same time, e.g. topomaps, street maps and marine maps. Size and weight. There's not a lot of variation in weight in the outdoor units. The ones in our list below are all between 150 and 260 grams. Coordinate systems. For outdoor use in New Zealand, your unit should support three coordinate systems: NZ Map Grid, NZ Transverse Mercator and WGS-84 lat/long. NZ Map Grid is used for the the NZMS260 and other topographical maps. The coordinate system for general mapping is being changed to NZ Transverse Mercator and from Sep 2009, this will be the coordinate system for printed topomaps. Track recording. 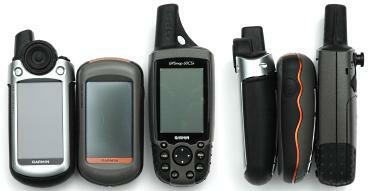 Handheld GPS units can usually record your track. There are many options for how frequently you can save your position. The GPS also has limited storage for track data. Most of the GPS Garmin units have a limit of 10,000 track points. If you're away for a week or two and don't have the opportunity to download tracks to a computer this may not be enough. The eTrex and GPSMap 60 series GPS uits can archive up to 20 tracks to save storage, but the date/time information is lost during archiving and the track points are thinned. If detailed track recording for an extended period of time is important, take a look at the Garmin Oregon and Colorado models. They have automatic archiving and the archives are preserve the timestamps and all the track points. Price. Obviously a factor. One way to simplify the bewildering array of GPS choices is to start with a price range and then see if you can find a model that meets your needs. Don't forget to factor in the cost of the topomaps, street or marine maps that you may want. The following are a few suggestions from the Garmin range for outdoor use. They cover the range from the most basic non-mapping to the most capable mapping units. The list is confined to high-sensitivity models. The battery life figures are taken from Garmin specs - remember that actual battery life may vary depending on the type of battery and various GPS settings. The prices are typical street prices in NZ dollars at the time of writing. The Garmin Oregon series outdoor units have larger screens and would be a good compromise for in-vehicle and tramping use. The Garmin GPSMAP 60 and Garmin GPSMAP 62 series could have smaller screens, but are probably better suited to heavy-duty outdoor use. For in-vehicle use, any of the Garmin Nuvi units should be considered. Navman and Tom Tom are also popular. Finally, Google is a great resource of reviews and opnions on specific models. GPS units can fail. They can get dropped, drowned or lost and batteries go flat. If you're in steep country under a dense tree canopy the GPS may not get a lock. 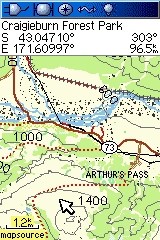 So if you plan to use the GPS for navigation in the wilderness, you should also take a paper maps and a compass as a backup and know how to use them. Copyright © 2009-2011 Integrated Mapping Ltd. All Rights Reserved. This article may not be reproduced without permission. Garmin is a trademark of Garmin Corporation. Our review of the Garmin GPSMAP 62s GPS.